The two variables discussed so far – pitch and tempo – are both measurable, objective features of bird song. The third variable, quality, is a subjective (qualitative) impression. Listen to this recording to hear a dramatic difference in the overall quality of two bird songs. 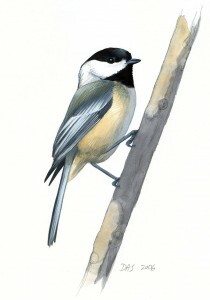 Compare the dry, mechanical “zeeee-buzzzz” of the Blue-winged Warbler, and the sweet, clear whistles “fee-beeyee” of the Black-capped Chickadee. In the narrowest sense, the quality of a bird’s voice would refer strictly to the tonal quality of the sound. Musicians call this “timbre”, and it allows us to distinguish a trumpet from a violin from a flute, even when all are playing the same note, and even though we cannot describe the differences in words. There are such differences in bird’s voices, but when birders refer to the “quality” of a bird song, we are almost always using it in a broader sense to mean our overall impression of the song (including the timbre of the voice along with everything else). In the recording above, for example, the warbler does not have a buzzy voice. The song sounds buzzy because of its tempo (a series of short notes repeated very rapidly) which creates the overall impression of a buzz. In any species this impression comes from the effect created by the pitch and timing of the notes, as well as transitions and pauses over the course of the whole song. Since this is a subjective and general description of the sound, it gives us the freedom to use vague and poetic words like liquid, metallic, sweet, mechanical, fluting, etc in our efforts to convey the character of a bird’s performance. In these recordings of two similar-sounding species, listen for subtle but distinct differences in their voices. There is a slightly stronger and richer quality to the voice of the robin, contrasting with a weaker, more wheezy or husky sound to the grosbeak, and the robin has some liquid-sounding transitions from one note to the next, revealing its relationship to the other thrushes. The difference in voice is augmented by differences in delivery. In the robin’s song the beginning and ending of each note are more abrupt, while the grosbeak fades in and out tentatively. The robin is more methodical, more regimented, repeating similar or identical phrases with distinct pauses, and the grosbeak sings a more varied series of phrases with irregular and poorly-defined pauses. All of this can be summarized in evocative descriptions of quality. The grosbeak’s song is more relaxed, tentative, mellow, and sing-song, with a husky or wheezy quality. The robin’s song has a strong, clear, liquid quality, with phrases delivered crisply and often repeated. All of the recordings linked in this series are from the collection at Xeno-canto http://www.xeno-canto.org. This outstanding resource features the work of thousands of dedicated naturalists, all presented in an intuitive and functional website. My yard is surrounded by trees. A bird sits, hidden, in a tree near the yard and puts out a single note all throughout the day…dawn to dusk. I have been unable to identify the bird or the bird call. Any ideas? I forgot to say that I live in central Virginia.